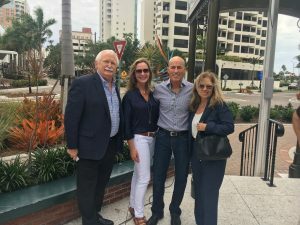 The City of Sarasota added the 84th piece of public art to their collection on April 8, 2019 with the dedication of Jeffrey Laramore’s Jumping Fish in the roundabout at the intersection of Palm Avenue and Cocoanut Avenue. Our executive director, Jim Shirley, lead the dedication ceremony which included a ribbon cutting with members from the City’s Public Art Committee and Mayor Alpert. 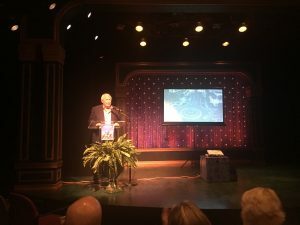 The ribbon cutting was followed by a reception at Florida Studio Theatre that was sponsored by Morgan Stanley, The Bellwether Group in partnership with Alfstadt&, Sarasota Magazine, and the Alliance.